The goats upon the heath. Edward Brailsford was a much beloved minister in the Methodist Church and known as a lover of nature. This is amply shown in this hymn. The closing line of the first verse is significant in that he accepts that he too is part of nature, perhaps unconsciously taking a Darwinian position. This is the kind of subject that hymn writers have long thought suitable for children. 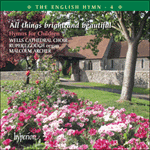 This hymn however is often to be found in the adult section of hymn books (as indeed is ‘All things bright and beautiful‘), indicating perhaps that it is one of those ‘all age’ hymns. The tune was written to be sung to a metrical psalm, but its lively rhythm makes it suitable for these words.